A radial engine is a type of aircraft engine in which the cylinders are arranged in a circular fashion around the crankcase. This provides for more efficient cooling. There are two types of radial engines. 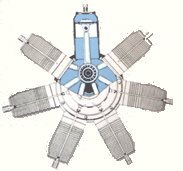 The stationary radial remains fixed to the airplane and the rotary engine where the engine and propeller revolve around a fixed crankshaft.